Anmol Publications Pvt. Ltd., 2003. Hardcover. New. Encyclopaedia of Bangladesh is a pioneering attempt by the reputed scholars to bring together not only the all aspects of the history and culture of Bangladesh but also provides factual details of the geographical features, philosophy, religion, socio-economic life of rural and urban people, history of politics and political developments, folk culture, art and architecture, literature, dance and drama, painting, and women and their socio-political status of Bangladesh since the earliest time to present day in a logical sequence and alphabetical order. Bangladesh is the second most densely populated nation in the world. India virtually surrounds the whole country on the west, north and east; on its southeast is Burma. Its area is 55,598 sq. miles/144,020 sq. km. According to the tradition the people who fled from the Gangetic plains to escape capture and enslavement by the Aryans came and settled in Bengal. Later, the Buddhists also came and took refugee in these parts from the aggressive Brahmans, It was probably the Guptas who annexed major part of this area in their imperial fold and brought about some sort of unification of Bengal. But Gupta supremacfy was not totally unchallenged and smaller rulers retained virtual independence. The first time Bengal as really unified was under the Palas in the eighth century A.D. Islam was brought to Bengal by Muslim traders and traveling Sufis/saints. From the very beginning Islam was introduced into the Indian Subcontinent, and Islam`s message of equality and brotherhood had deep impact on a substantial part of population. The early Muslim rulers of Delhi especially the Tughluqs conquered most parts of Bengal. Under the indepdent Ilyas Shahi rule in mid-fourteenth century again Bengal was properly unified and it was during this rule that the name Bangala was coined for the entire country. Under the Mughals again Bengal was unified. The Britishers came to India as traders and gradually through cheat, deceit, bribery and corruption they started extending their grip all over the Subcontinent. Their first military victory was in Bengal at the Battle of Plessey in 1757. Astutely following their policy of divide and rule, they completely routed the last Mughal Emperor, Bhadur Shah Zafar, in 1857, in Delhi and thus became the masters of the whole of India. Bengal Presidency under the British rule extended from the frontier of Assam to the border of United Provinces which were to be dominated by the Bengali-speaking people. In 1905 the Colonial British Government divided Bengal into two parts-east and west-despite strong resentment by the people and statesmen. But this plan did not work and ultimately this partition was annulled in 1911. Subsequently Bihar and Orissa became separate provinces and Bengal became a province of Bengali-speaking people only. In 1947 with partition of India into India and Pakistan, East Bengal became the part of Pakistan. West Bengal in India comprised of old Rarh and Gaurha, while East Bengal in Pakistan covered Varendra, Vanga and Samatata. The Pakistani Constitution of 1956 named East Bengal as East Pakistan. The dissolution of West Pakistan and consequent recreation of the old provinces with their old names gave rise to the demand for renaming East Pakistan as Bangladesh. This demand also signified the resurgence of Bengali nationalism. By the beginning of 1970, Bangladesh became the commonly accepted name for East Pakistan. It was expected that the National Assembly elected in December, 1970 would designate Bangladesh as a state in the Federation of Pakistan. The failure of the democratic process and the constitutional method in Pakistan in the wake of Yahya`s armed attack on the Bengalis and his usurpation of power by nullifying the results of the popular election gave birth to the independent state of Bangladesh on April 26, 1971. Instea Printed Pages: 9658. Dhaka, Bangladesh: The International Centre for Study of Bengal Art, 1999 Printed Pages: 520 with numerous colour and b/w plates.. First Edition. Paperback. New. 22 Cms x 28 Cms. Dhaka, Bangladesh: The International Centre for Study of Bengal Art, 2009 Printed Pages: 306 with numerous colour and b/w plates.. First Edition. Paperback. New. 22 Cms x 28 Cms. Dhaka, Bangladesh: The International Centre for Study of Bengal Art, 2010 Printed Pages: 315 with numerous colour and b/w plates.. First Edition. Paperback. New. 22 Cms x 28 Cms. Dhaka, Bangladesh: The International Centre for Study of Bengal Art, 2005 Printed Pages: 455 with numerous colour and b/w plates.. First Edition. Paperback. New. 22 Cms x 28 Cms. Kalpaz Publications/Gyan Books Pvt Ltd, 2002. Hardcover. New. Conceptualisation of Dalit Leadership in Indian Democratic Policies is a difficult preposition. The book is a modest attempt to understand the same and many other related issues with the Dalit leadership in India. The facts and figures about the origin, growth and development of Dalit Leadership in Indian Society are missing from the main stream academia though the Dalit Leadership has a long History of struggle. An examination about the Nature and dynamics, strategy or strategies adopted for mobilisation and Empowerment of the Dalit masses, is also not found in different streams of discipline taught at the universities and colleges. Therefore, it is imperative to explore the aforesaid unexplored facts, issues, mysteries etc. about the Dalit Leadership at this crucial juncture when Dalit Assertion has become a socio-political reality. The present book successfully answers most of these queries regarding the Dalit Leadership in a very lucid manner. Contents: List of Tables Foreword Preface Introduction 1. Research Design 2. Socio-Historical Profile of Dalit Leadership in India and the Role of Ambedkar 3. The Research Setting 4. Nature of Dalit Leadership in Uttar Pradesh 5. Dynamics of Dalit Leadership 6. Socio-Political Mobilization and Empowerment 7. Conclusion Printed Pages: 290. Dhaka, Bangladesh: The International Centre for Study of Bengal Art, 2003 Printed Pages: 310 with numerous colour and b/w plates.. First Edition. Paperback. New. 22 Cms x 28 Cms. Dhaka, Bangladesh: The International Centre for Study of Bengal Art, 1998 Printed Pages: 302 with numerous colour and b/w plates.. First Edition. Paperback. New. 22 Cms x 28 Cms. Dhaka, Bangladesh: The International Centre for Study of Bengal Art, 2000 Printed Pages: 315 with numerous colour and b/w plates.. First Edition. Paperback. New. 22 Cms x 28 Cms. Dhaka, Bangladesh: The International Centre for Study of Bengal Art, 2002 Printed Pages: 299 with numerous colour and b/w plates.. First Edition. Paperback. New. 22 Cms x 28 Cms. Dhaka, Bangladesh: The International Centre for Study of Bengal Art, 1997 Printed Pages: 309 with numerous b/w plates.. First Edition. Paperback. New. 22 Cms x 28 Cms. Cambridge University Press, 2000. First edition. Softcover. New. This volume is a chronological survey of women`s writing in France from the sixth century to the present day. Specially-commissioned essays by leading scholars provide the first introduction in English to the wealth and diversity of French women writers, offering new readings and new perspectives. Each chapter focuses on a given period and range of writers, taking account of prevailing sexual ideologies and social, political, economic and cultural surroundings. Extensive reference features include a bibliography and guide to more than one hundred and fifty writers and their works. Contents Introduction Sonya Stephens 1. Female voices in convents, courts and households: the French middle ages Roberta L. Krueger 2. To choose ink and pen: French Renaissance women`s writing Cathleen M. Bauschatz 3. Altering the fabric of history: womenâs participation in the classical age Faith E. Beasley 4. The eighteenth century: women writing, women learning Jean Bloch 5. Eighteenth-century women novelistsâ genre and gender Martin Hall 6. The 19th century: shaping women Rosemary Lloyd 7. 1900â1969: writing the void Alex Hughes 8. From order to adventure: womenâs writing since 1970 Leslie Hill 9. Changing the script: women and the rise of autobiography Michael Sheringham 10. Women poets of the twentieth century Michael Bishop 11. Voicing the feminine: French women playwrights of the twentieth century Mary Noonan 12. Feminist literary theory Judith Still Bibliography of women writers and their work. Printed Pages: 324. Viva Books Private Limited, 2011. First edition. Softcover. New. Business Essentials range is the ideal learning solution for all students studying for business related qualifications and degrees. The range provides concise and comprehensive coverage of the key areas that are essential to the business students. Qualifications in business are traditionally very demanding. Students therefore need learning resources which go straight to the core of the topics involved, and which build upon studentsâ pre-existing knowledge and experience. Business Essentials range has been designed to meet exactly that need. Viva-BPP Learning Mediaâs Business Essentials range is the ideal choice for numerous business qualifications. The Course Books offer the perfect learning solution for a multitude of business-related courses. The Course Books lend themselves specifically to: â¢ use on courses leading to degrees and diplomas in business from a variety of institutions â¢ use as generic texts on a wide range of business-related subjects â¢ background reading and reference material for learners and lecturers alike The Course Books provide concise and comprehensive coverage of all aspects of Business, with these key features: â¢ A user-friendly format for east navigation â¢ Chapter introduction and summaries to put the topic into perspective â¢ Plenty of up to date illustrations and case studies for students to discuss or work through individually â¢ Numerous timed activities to ensure consolidation of knowledge and further thought, with suggested answers. â¢ Quick quizzes at the end of each chapter to ensure understanding â¢ A glossary of terms and full index Contents: Part A: Market Intelligence â¢ Buyer Behaviour and the purchase decision-making process â¢ Marketing Research â¢ The Process and Forms of marketing Research â¢ Marketing Research Techniques â¢ Customer Satisfaction â¢ Part B: Marketing Planning and Market Vision â¢ Organisational Capability â¢ External Environment Analysis â¢ Competitor Analysis â¢ New Products â¢ The Extended marketing Mix â¢ Implementation and Ethical Issues â¢ Index. Printed Pages: 352. Dhaka, Bangladesh: The International Centre for Study of Bengal Art, 1996 Printed Pages: 262 with numerous b/w plates.. First Edition. Paperback. New. 22 Cms x 28 Cms. PHI Learning, 2010. Softcover. New. The role of Managerial Economics has become all the more important today because of the increasingly competitive business world and the financial implications of many managerial decisions in such a scenario. This compact yet comprehensive book discusses the basic concepts and techniques of microeconomic analysis and their applications to managerial decision making with many useful and practical examples. The text explains the basic concepts of the demand function and demand curve, the supply function and the supply curve, demand elasticities and their applications, techniques of demand estimation, and the theory of consumer behaviour. It also analyzes the theory of production, clarifies the nature of economic costs, and describes the profit maximizing tools of a business firm. Finally, the book describes standard pricing rules under different assumptions about the structure of the market in which the firm operates and examines certain pricing practices such as mark-up pricing and multiple products pricing. CONTENTS: Preface 1. DEMAND-SUPPLY ANALYSIS 2. ELASTICITY AND ITS APPLICATIONS 3. DEMAND ANALYSIS, ESTIMATION AND FORECASTING 4. THEORY OF CONSUMER CHOICE 5. WELFARE ECONOMICS 6. PRODUCTION ANALYSIS OF THE FIRM 7. ANALYSIS OF COST OF PRODUCTION OF THE FIRM 8. PROFIT ANALYSIS OF THE FIRM 9. PERFECTLY COMPETITIVE MARKET 10. MONOPOLISTIC MARKET 11. MONOPOLISTIC COMPETITIVE MARKET 12. OLIGOPOLY MARKET 13. GAME THEORETIC APPROACHES TO OLIGOPOLY 14. PRICING PRACTICES Index Printed Pages: 304. Jaypee Brothers Medical Publishers (P) Ltd., 2000. First edition. Softcover. New. 14 x 21 cm. Contents * Embryology * Histology * Head and Neck * Upper Limb * Thorax * Abdomen * Lower Limb * Central Nervous System * Musculoskeletal System * Genitourinary System Printed Pages: 132. PHI Learning, 2009. 2nd edition. Softcover. New. For courses in managerial economics, this textbook, now in its second edition, is specifically designed for students of management, commerce and economics to provide them with a thorough understanding of economic concepts and methodologies and the economic environment influencing managerial decisions. The book first lays a sound theoretical foundation of basic concepts, definitions, and methodologies of economics, being an essential prerequisite for students to understand the theory of managerial economics. All the basic principles are introduced with mathematical complexity kept to minimum-essentials of applied mathematics needed for comprehending the underlying ideas of models and theories of economics are covered. The book then moves on to systematically enumerate the various tools of analysis such as demand analysis, cost analysis, elasticity of demand, production analysis and price theory, and highlights their importance in managerial decision making through the concept-example format, wherein a concept discussed is immediately followed by a practical situation so that the reader can understand its application. The end-of-chapter questions reinforce a deeper understanding of the concepts introduced in the text. An exclusive chapter on linear programming emphasizes the importance of this mathematical tool in finding optimal business solutions. The book concludes with an exhaustive introduction to macroeconomics, analyzing in depth the concepts of inflation, income, savings and investments, and growth and employment in Indian context. CONTENTS: Preface. Preface to the First Edition. 1 Introducing Economics. 2 Basic Applied Mathematics. 3 Introduction to Managerial Economics. 4 Demand Analysis. 5 Elasticity of Demand. 6 Demand Forecasting. 7 Production Analysis. 8 Cost Analysis. 9 Pricing. 10 Linear Programming. 11 Introductory Macroeconomics. Glossary. References. Index. Printed Pages: 300. Cambridge University Press/Yoda Press. First edition. Softcover. New. 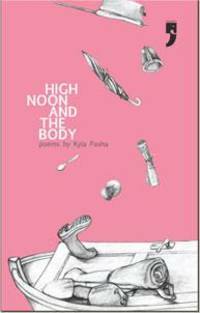 Kyla Pasha`s poems sparkle with the rediscovery of songâs electricity while losing none of the sophisticated edge of argument. Pashaâs poems move in several directions, unconstrained by doctrinaire notions of what a poem should do and be. She speaks to present, distant or departed interlocutors; meditates on how we lose and find ourselves again through travel; brings news of war to the front lawn, talks crisp commonsense to the robed spectres of Death and Memory. The self opens to the world, and the world to the self, in Pashaâs poems, through the realisation that we are formed by the irreducible compound of love, betrayal, forgiveness and anger that swirls constantly in the fragile crucible of the body. In the South Asian context, âwoman poetâ is all too often a title claimed by simple appeal to physiognomy and asserted through conformity with the dictionary of feminist clichÃ©. Kyla Pasha is among the exceptions to this norm, who work to earn their title. She crafts her way through the labyrinth of language, attending sensitively to image and cadence, the murmur of several tongues; if her ear is tuned to the intimate tremors of the heart, it also records the epic turbulences both of South Asia and a world in ecological and political meltdown. Printed Pages: 96. Amar Chitra Katha/ACK Media, 2016. 5th or later edition. Softcover. New. 17 x 24 cm. Ganesha is the son of Shiva and Parvati. He is considered the god of wisdom. The devotees worship him at the start of any new undertaking for its success. The god is special in that he carries the head of an elephant. Ganas were attendants of Shiva and Parvati. Once Parvati, alone at home and going for a bath, asked one of the Ganas to stand as guard and not allow anyone in. The Gana made an exception of Shiva, which made Parvati angry. Shiva told her to have her own Gana. She made one out of the saffron paste on her body, called him her son and posted him as guard. This Gana boy refused entry to Shiva, fought Shiva`s Ganas and even the gods that came to assist them. Finally, Shiva beheaded him, only to find Parvati extremely angry for Shiva had harmed her son. Shiva revived the Gana with the head of the first creature found, which was an elephant. Thus it happened that the elephant-headed son of Shiva and Parvati became Ganesha, `Chief of Ganas`. Printed Pages: 32.